Today I continued using indigo. This time I used an Indigo kit from Jacquard. 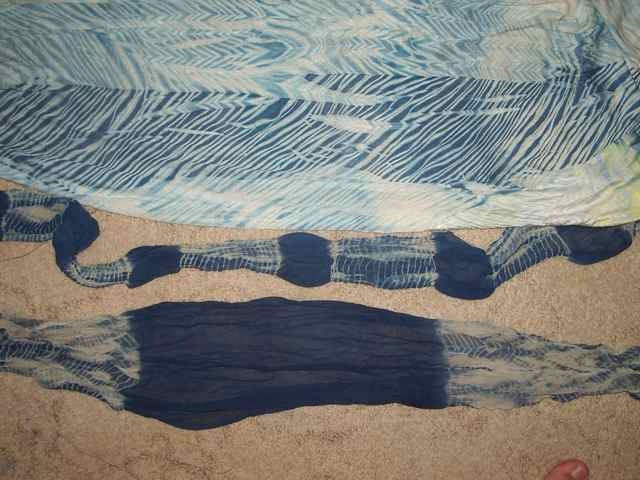 It uses pre-reduced indigo so is easier to use than the stuff I used last week (color run remover and washing soda). The colour produced was much darker and was the colour I wanted. The whole process ended up messier though. Each piece of fabric needs to be laid out flat or hung up to allow the colour to develop. 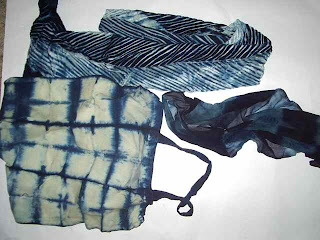 I highly recommend the kit but also suggest that Indigo dyeing would be better to done outside on the grass. Unfortunately, by the time I decided this, I had already dyed quite a lot of the surfaces blue and spent some time scrubbing them down at the end of the day. I have a lot of fabric to wash out and get dry. At the moment it is all in a bucket. The kit was easy to use, is available in New Zealand and the results are very good. There is still enough indigo left in the vat for me to continue next week (I hope). The disadvantage with this system is that it only uses warm water so you get less 'crinkle' in silk. 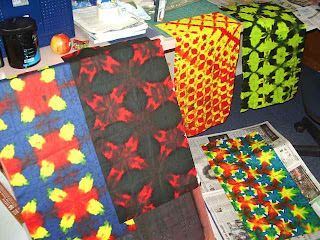 The previous method I used, used very warm water so the silk pieces are left with 3D shapes from the ties. 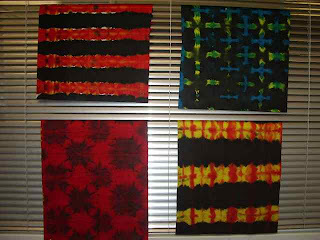 See photo above, these are pieces from the hot water method we used last week. Here are some of the much darker pieces from today's session with the Jacquard kit. I will post more tomorrow when I have rinsed all the pieces out. 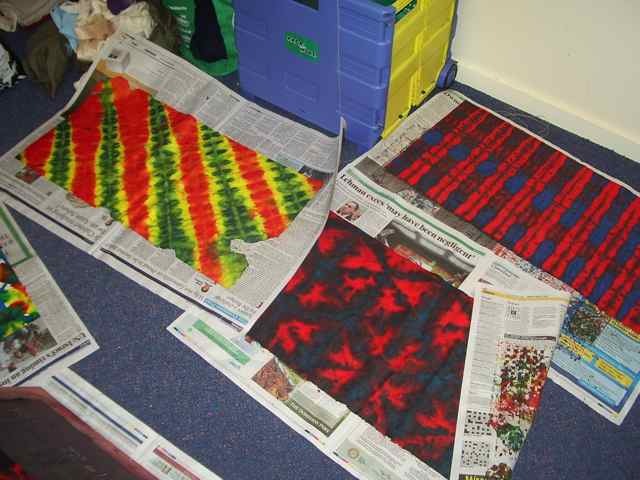 Here are some photos of the papers I dyed on Wednesday (day 18), which are currently strung around the room at Whitireia. 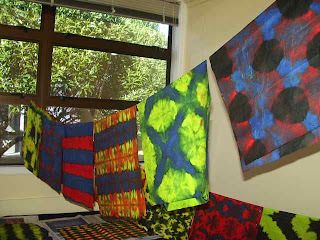 They are taking a long time to dry and are very fragile at the moment. The paper is Chinese calligraphy paper. 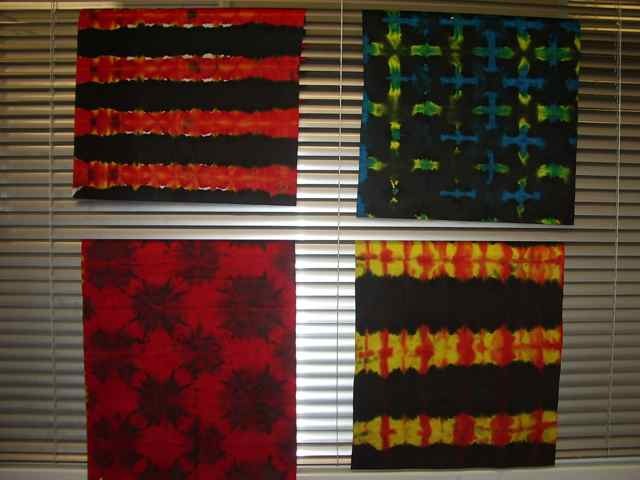 It absorbs the dye very well and is strong when it is dry. Thanks this is great. I have been wondering how the Indigo kit works. Maybe I will wait for a fine day.